Partnerships between government, universities, and industry have formed the foundation of the national research enterprise for more than half a century, driving science and technology breakthroughs that have created significant social and economic benefits for the nation and the world. However, there is growing recognition that the partnerships supporting the U.S. innovation ecosystem extend beyond the “triple-helix actors” to include other stakeholders. Philanthropic institutions, angel and venture capital groups, political advocates, and nongovernmental organizations participate as partners in funding, influence, and support of basic science and research and development. How these partnerships are established and maintained, how effective they are in supporting science and innovation, and how to assess their overall impact on the U.S. research enterprise are increasingly relevant questions for leaders in both science and policy. 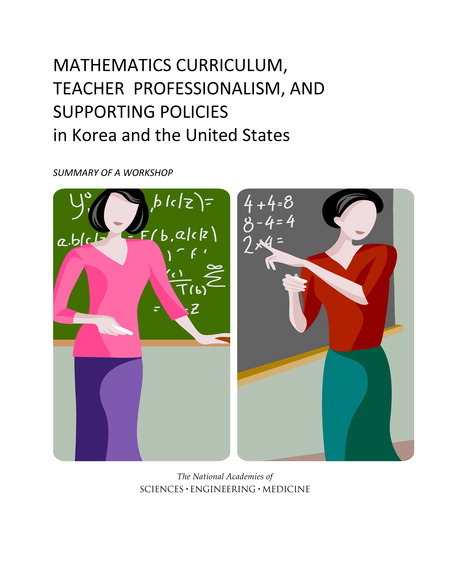 For the past 17 years, the U.S. National Commission on Mathematics Instruction (USNC/MI) has held workshops with mathematics educators from countries that typically perform well on international assessments and have a history of strong mathematics education programs, such as Japan, China, and South Korea. Finland is among this group. Even though its mathematics education system has some common characteristics with other top-performing nations, such as a great social respect for the teaching profession, it also has unique characteristics. 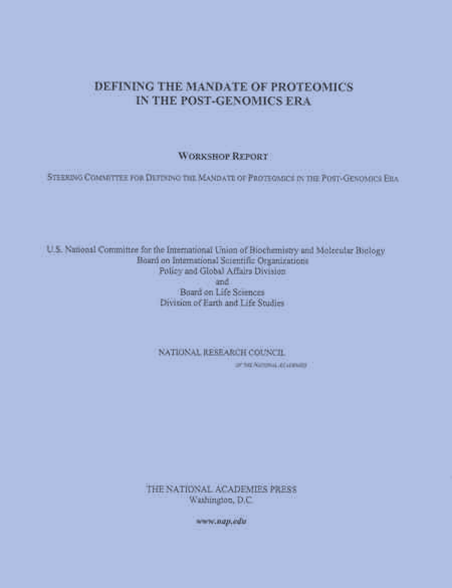 Since the end of WWII, the United States has developed the world's preeminent system for biomedical research, one that has given rise to revolutionary medical advances as well as a dynamic and innovative business sector generating high-quality jobs and powering economic output and exports for the U.S. economy. However, there is a growing concern that the biomedical research enterprise is beset by several core challenges that undercut its vitality, promise, and productivity and that could diminish its critical role in the nation's health and innovation in the biomedical industry. The field of computer science (CS) is currently experiencing a surge in undergraduate degree production and course enrollments, which is straining program resources at many institutions. What does this growth mean for the future of CS programs, the role of computer science in academic instiuttions, the field as a whole, and U.S. society more broadly? This report describes current trends in computing enrollments, drivers of the enrollment surge, and the likely effects on students, faculty, and institutions. It provides recommendations for what institutions of higher education, government agencies, and the private sector can do to respond to the surge and plan for a strong and sustainable future. (Board on Higher Education and Workforce / Computer Science and Telecommunications Board). Mentoring has long been understood as a beneficial component of academic and professional development. But investigations of the attributes of effective mentoring interactions in science, technology, engineering, mathematics, and medical (STEMM) education are only now starting to shed light on how exactly these complex and dynamic relationships form, evolve, and impact the lives and careers of the current and next generation of STEMM professionals. (Board on Higher Education and Workforce). Research universities are critical contributors to our national research enterprise. They are the principal source of a world-class labor force and fundamental discoveries that enhance our lives and the lives of others around the world. These institutions help to create an educated citizenry capable of making informed and crucial choices as participants in a democratic society. However many are concerned that the unintended cumulative effect of federal regulations undercuts the productivity of the research enterprise and diminishes the return on the federal investment in research. (Committee on Science, Technology, and Law (CSTL)/Board on Higher Education and Workforce (BHEW)). Students, parents, and government agencies need as much information as possible about the outcomes of the higher education experience and the extent to which they can expect a fair return on their investment in higher education.In order to better understand the concept of quality - enabling students to acquire knowledge in a variety of disciplines and deep knowledge in at least one discipline, as well as to develop a range of skills and habits of mind that prepare them for career success, engaged citizenship, intercultural competence, social responsibility, and continued intellectual growth - an ad hoc planning committee of the National Academies of Sciences, Engineering, and Medicine Board on Higher Education and Workforce, with funding from the Lumina Foundation, organized a workshop in Washington, D.C., on December 14-15, 2015.This report summarizes the presentations and discussion of that event. (Board on Higher Education and Workforce). Higher education is a linchpin of the American economy and society: Teaching and research at colleges and universities contribute significantly to the nation's economic activity, both directly and through their impact on future growth; federal and state governments support teaching and research with billions of taxpayers' dollars; and individuals, communities, and the nation gain from the learning and innovation that occurs in higher education. Comprehensive research and a highly trained workforce are essential for the improvement of health and health care both nationally and internationally. Over the past 40 years the National Research Services Award (NRSA) Program has played a large role in training the workforce responsible for dramatic advances in the understanding of various diseases and new insights that have led to more effective and targeted therapies. In spite of this program, the difficulty obtaining jobs after the postdoc period has discouraged many domestic students from pursuing graduate postdoc training. In the United States, more than 50 percent of the postdoc workforce is made up of individuals who obtained their Ph.D.s from other countries. Indeed, one can make a strong argument that the influx of highly trained and creative foreigners has contributed greatly to U.S. science over the past 70 years. 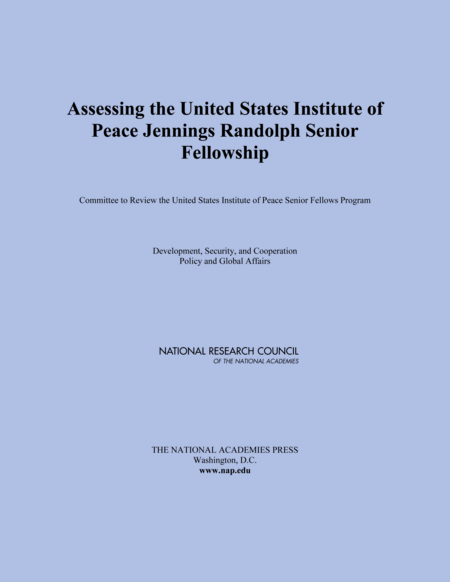 A Revised Guide to the Methodology of the Data-Based Assessment of Research-Doctorate Programs in the United States (2010) is a detailed explanation of the methodology used to collect data and calculate ranges of rankings. 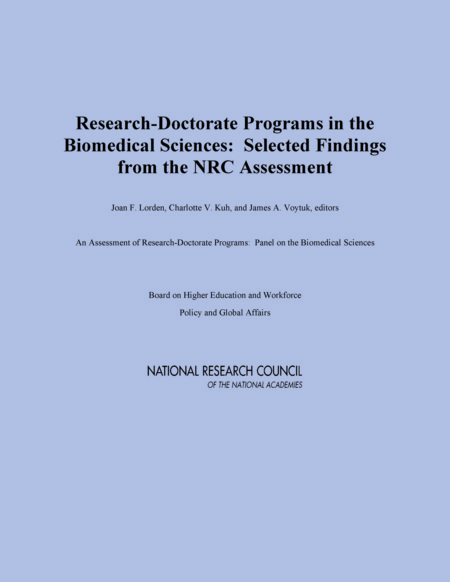 This version of the methodology guide replaces A Guide to the Methodology of the National Research Council Assessment of Doctorate Programs (2009). Facilitating Interdisciplinary Research examines current interdisciplinary research efforts and recommends ways to stimulate and support such research. Advances in science and engineering increasingly require the collaboration of scholars from various fields. This shift is driven by the need to address complex problems that cut across traditional disciplines, and the capacity of new technologies to both transform existing disciplines and generate new ones. At the same time, however, interdisciplinary research can be impeded by policies on hiring, promotion, tenure, proposal review, and resource allocation that favor traditional disciplines.